In support of the National Breast Cancer Foundation and in CED’s concern for the personal safety and protection to our customers’ and their loved ones, we now offer two excellent protection products. 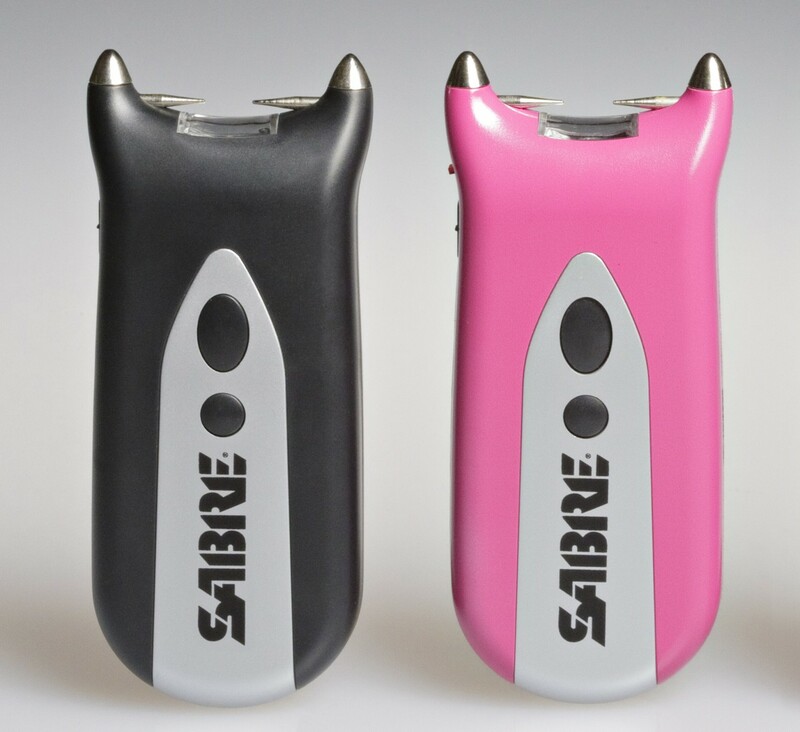 The SABRE Stun Gun in either pink or black color, packs more volts (800,000 to be precise!) into a smaller product, ideal for personal carry. Compact in size, this new narrow width stun gun is designed with a safety switch to prevent accidental discharge, a built-in LED flashlight, a red LED light to alert the user when the stun gun is armed, includes a holster, and comes with (2) Lithium Ion batteries included. Uses two CR123A lithium batteries. Batteries not included. IMPORTANT: Stun Guns are NOT legal to own, carry, or use in some Cities and States within the USA. Make sure that you are aware of restrictions BEFORE you place your order. Always use self-defense devices with care to prevent harm to unintended victims. DISCLAIMER, RELEASE, ASSUMPTION OF RISK, WAIVER OF LIABILITY AND INDEMNITY AGREEMENT: COMPETITIVE EDGE DYNAMICS (CED) is not responsible for any physical harm or damage from the use or misuse of self-defense devices including a stun gun or Pepper Spray purchased from us. By purchasing a self-defense device, including a stun gun or pepper spray from us you understand that Competitive Edge Dynamics (CED) does not warrant that you may legally purchase, possess, or carry these products according to any state or local laws. You also acknowledge that you have determined their legality before purchasing and that you are an adult of at least 18 years of age and under no legal disability, have no drug addiction, and have no criminal record. By purchasing a self-defense device, including a stun gun or pepper spray from Competitive Edge Dynamics (CED), the buyer warrants that he/she is in compliance with all applicable federal, state and local laws and regulations regarding the purchase, ownership and use of the item. The buyer expressly agrees to indemnify and hold harmless Competitive Edge Dynamics (CED) for all claims resulting directly or indirectly from the purchase, ownership and use of the item in compliance or violation of federal state and local laws or regulations. Please check local laws before ordering any self-defense device, including a stun gun or Pepper Spray. It is recommended that all purchasers / users carefully read and follow manufacturer's instructions and seek proper training with stun guns before carrying and using a stun gun. WE DO NOT SHIP TO NY, NJ, MA, MI, IL, RI, HI, Philadelphia, Chicago, Baltimore D.C. as they are NOT legal in these states and cities listed.